A whitish haze, called “chocolate bloom,” may appear on the surface of various chocolate types including dark, bitter-sweet or semi-sweet, milk, or even unsweetened chocolate. This bloom is caused by either the cacao butter aka cocoa butter and/or sugar rising to the surface, often due to exposures to high temperatures or sunlight (say due to being stored in a car with issues of the “green house effect” coming through car windows) and then the cooling off of the chocolate. The presence of chocolate bloom has NOTHING to do with the safety aspect of eating the item as food technologists remind us–it only affects its appearance. The quality of the chocolate has likely been affected due to such fluctuations in its storage. If stored improperly, realize that the item may not “taste” the same nor have the same “creamy” mouthfeel texture it previously had. White or pastel colored types contain NO cocoa liquor aka chocolate liquor, must contain at least 20% cocoa butter, and should contain no more than 55% sugar content. Do NOT refrigerate or freeze any types thinking you can accomplish longer term storage that way. Particularly if you purchase “artisan” prepared chocolate from a local chocolatier, the item is meant to be consumed in shall we say a timely manner. Think of consuming actual chocolate as a small, sensory packed experience to be savored while it is still optimally fresh, particularly if more perishable fruit, etc., has been incorporated into the delicacy. Image of chocolate covered strawberry courtesy of crazeeoutoflove10 at photobucket. 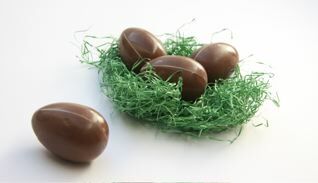 If you do indulge in chocolate this spring as Easter arrives and Lent ends, or to celebrate Passover, etc., our suggestion would be to buy less of the best and enjoy it more!